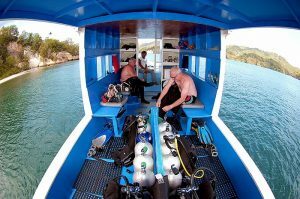 All dive boats of Divers Lodge Lembeh are designed by, made for and built by divers. All dive locations are reached by boat, so a reasonable amount of time is spent on board a boat. This is why we think that the trip to the dive spot, preparing for the dive and the time in between dives should be as comfortable as possible. We have designed our five dive boats to provide comfort combined with convenience. The boats differ in size and are equipped for a maximum of two, four or six guests. With a maximum of fourteen guests at the resort, the boats are never crowded. Cool drinking water, tea, coffee, biscuits and fruit are available at any time. A large cabin provides shelter from the rain and sun, but if you like, you can sunbathe on the bow deck. Dive gear is stored and prepared in the mid-deck area. Entering and exiting the water is easy and you are welcome to put your gear on and take it off in the water. There is a toilet at the back of each boat. Because we also visit remote dive sites on the ocean side of Lembeh Island, our boats are designed to withstand strong winds, heavy seas and the sometimes fickle weather conditions of these tropical waters. Two or three outboard motors propel the boats. 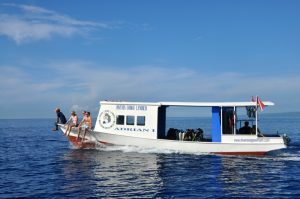 We believe we have the best dive boats in the Lembeh Strait! Life jackets, an emergency kit, oxygen tank, a mobile phone and spare parts for diving equipment are kept on board. All of our boats are equipped with navigation lights. If you book a “private boat” you and your buddy (or buddies) will be guaranteed a boat to yourselves, making it easy to choose where and when you dive. In any case, the boats will never be crowded as usually no more than six guests will be on board for any trip. 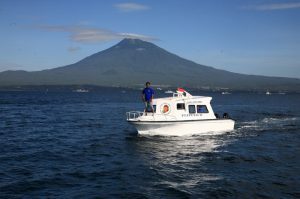 Last but not least, our boat trips provide unforgettable views of the harbour, the town of Bitung, the villages, the landscapes and the seafarers of Lembeh Strait, so bring along your land camera to capture these images.